While media pundits have interpreted the Chinese Karmapa Ugyen Trinlay’s impact on Sino-Indian relations, one can only properly understand this story in the context of Tibetan history. Without an historical perspective, it is easy to miss the mistaken assertions riddling many media accounts. Stated as fact, one mistaken assumption is widely repeated: Namely, His Holiness the Dalai Lama must approve the recognition of the Karmapa. Recently, pre-eminent former Foreign Secretary J.N. Dixit innocently repeated this claim in a January 19th column in this paper.Tibetan history presents a tangled web of religion and politics, and understandably, numerous newspaper and TV accounts have failed to separate these two threads. But doing so is critical to separate fact from fiction. However, the truth is simple. By tradition and history, the Dalai Lama has never had the power to recognize the Karmapa. This incorrect assertion mostly likely derives from confusing the Dalai Lama’s political authority with his spiritual authority. While the Dalai Lama has historically lead the Tibetan government, his spiritual authority has never extended beyond his own Gelugpa school. Let’s look at the historical facts. The first Karmapa Dusum Khyenpo lived in the 12 century, over 300 years before the Gelugpa school was even founded and before the first Dalai Lama was recognized. (In fact, scholars all agree that the Gyalwa Karmapa line holds the distinction of being the first appearance of reincarnated lamas in Tibetan Buddhism.) Five Karmapas reincarnated before the first Dalai Lama appeared. Therefore, it is an historical impossibility to claim that the Dalai Lamas have always anointed the Karmapas’ reincarnation. Two historical incidents illustrate this point. Chinese Emperor Yung Lo, who was a disciple of the 5h Karmapa, planned to invade Tibet and merge all four schools, including the Gelugpas, under Kagyu authority. 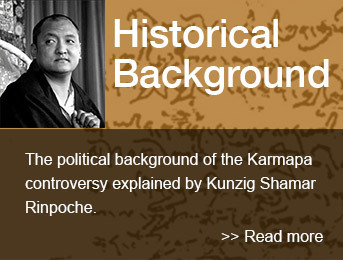 However, the 5th Karmapa Dezhin Shagpa blocked the scheme, saying each school had a spiritual right to exist. When the 5th Dalai Lama ruled Tibet, his disciple, a Mongolian lord, suggested a similar scheme, but the Dalai Lama refused. Starting in 1962, however, tradition and history were reversed. In that year, the current Dalai Lama attempted to merge all four schools under his authority. While the late 16th Karmapa recognized the Dalai Lama’s political authority, he led the three other schools in fighting the consolidation. Two weeks ago, the Tibetan government in exile issued a proclamation asserting their power to recognize the reincarnations of all four schools. This declaration went unchallenged in the media, only reinforcing the misperception about the extent of the Gelugpa school’s spiritual authority. Regarding the nominations of each school as published as “TIBETAN ORDER” in the page eight of ‘The Sunday Times of India, New Delhi, January 16, 2000’ has some information which is incorrect. The head of he Sakyapa is hierarchy system. This has been unbroken from the time of Chengish Khan till now. The head of Nyingmapa, the Nyingma followers elected Penor Rinpoche in 1991. Thus the information given is incorrect. Jumping to the current situation with the Chinese Karmapa, one must examine the intersection of religion and politics again. The Chinese Karmapa wears the stamp of legitimacy, because the Dalai Lama has approved of the 14-year-old boy, according to the press. Unfortunately, the Chinese Karmapa’s appointment has more to do with politics than religion. But in collaboration with the Chinese government, Tai Situ Rinpoche appointed Ugyen Trinlay as a illegitimate nominee. Furthermore, Situ installed the boy at Tsurphu Monastery, which was the Karmapa’s seat in Tibet, and fixed his enthronement date. In addition to receiving the Chinese government’s backing, Situ then won the Dalai Lama’s validation for his candidate. Thus, he undermined my spiritual authority and our lineage’s traditions. Tai Situ’s actions have betrayed our school to two governments – the Chinese and the Tibetan government in exile. Regrettably, Situ Rinpoche has irrevocably damaged our lineage, and he has helped stage manage the Chinese Karmapa’s every move. In 1993, Chinese President Jiang invited Ugyen Trinlay to Beijing, and President Jiang said that Trinlay should receive six years of training in communist ideology. In 1999, six years later, Trinlay finished his training, and the Joint Action of Sikkim secretly met with Chinese officials in Lhasa, Tibet. Three months after the committee’s secret meeting, Ugyen Trinlay left Lhasa for this country, leaving a note saying he going to collect the crown. It is highly improbable for a 14 year old boy to travel 900 km by foot in the winter. As the Indian government has been considering asylum, the stories about Trinlay’s escape keep changing, first saying he went on foot, then by jeep, etc. As the second-highest ranking leader of the Karma Kagyu School, the Shamarpa lamas have been historically responsible for identifying the Karmapa’s legitimate reincarnation. Using the Kagyu school’s traditional methods, I selected Thaye Dorje as the true reincarnation of the Karmapa. I respect His Holiness the Dalai Lama as the ruler of Tibet, but I do not give away the Karma Kagyu School’s spiritual authority to his government in exile. For example, the Nyingma School faced competing reincarnations in 1992, which is the same year Situ appointed Ugyen Trinlay. At that time, the Dalai Lama backed one nominee as the reincarnation of Dujom Rinpoche, the highest Nyingma lama. On the other hand, Chadral Rinpoche recognized another candidate, and all Nyingma disciples followed their own school’s choice and ignored the nominee of the Dalai Lama. No harm was done to their lineage, because there was no traitor in their school. Nevertheless, I have compromised with the Chinese Karmapa’s supporters, and I am still willing to do so. In 1995, I discussed a compromise with Mr. Drugchu Lachaungpa, former Sikkim power minister and Joint Action Committeeman, and Mr. Palden Lachaungpa, Sikkim’s Chairman of the Ecclesiastical Department. Both sought me out to ask how to solve the problem. I said Tai Situ is a Buddhist teacher, and so am I. We should both behave accordingly. Therefore, we should both respect each other’s nominee, which would prevent any schism in the lineage. Drugchu then asked me who would own Rumtek Monastery? I explained that the Chinese government had authorized Ugyen Trinlay to take over Tsurphu, which was the Karmapa’s traditional seat in Tibet. Therefore, the logical solution would be to allow my nominee, the Indian Karmapa, to take Rumtek monastery in India. At that point, Drugchu asked how the Karmapa Charitable Trust would award ownership of the property. Answering in my capacity as a trustee, not a spiritual leader, I stated the Trust has no legal authority to determine who is the legitimate Karmapa. According to the Trust’s legal rules, it must hand over its assets to the Karmapa when he reaches the age of 21. Therefore, the Trust must hand over its assets to both the Indian and Chinese Karmapas when they reach 21. At that point, the Karmapas themselves must decide who owns what properties. Of course, I added the cavet that the Chinese Karmapa must be an Indian citizen to own property in India.